November is the month of giving thanks, and we gave a lot of thanks for all these new releases. Batman made his dramatic entrance, and a couple of old-school series added new content. All that, plus new Munchkin accessories galore, as well as a holiday-themed Munchkin coloring book and a limited edition of one of our most popular games! Who could ask for more? Look for these new releases at your friendly local game store, just in time for Christmas! Become a Super-Villain in Gotham City! Can you escape the World's Greatest Detective? The Joker, Catwoman, The Riddler, and Poison Ivy are pulling off elaborate heists to score as much loot as they can carry! 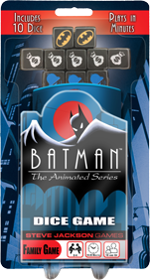 Based on the award-winning TV show, Batman: The Animated Series Dice Game lets you become a Super-Villain in a press-your-luck game for the whole family. Roll the dice and take advantage of each villain's diabolical abilities to scheme your way to victory before getting busted by Batman! You can find Batman: The Animated Series Dice Game at your local game store and select Hot Topic retailers. The humor of Munchkin and the fantasy of Pathfinder join forces again, with an all-new look! 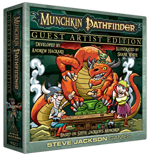 Munchkin Pathfinder Guest Artist Edition gives players the same goblin-bashing, dragon-slaying fun of the original, now illustrated by Shane White, whose art has been featured in the Pathfinder: Goblins! comic series. Iconic classes such as the Witch meet the Red Mantis Assassin and other factions to take on fan-favorite monsters such as the Whispering Tyrant and Lamashtu. Arm yourself, kill hordes of goblins, and grab all the treasure! Is your goblin horde more of a goblin clique? Not for long! 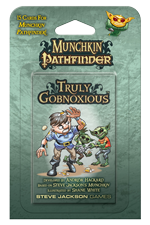 Swell your goblin ranks with Munchkin Pathfinder: Truly Gobnoxious, a booster for Munchkin that overruns your game with this classic fantasy enemy. What do Munchkin games and Christmas have in common? Both are chances to amass a bunch of new loot! That's where this playmat comes in: It helps you keep your Munchkin loot organized when you play. There are spots for held items, headgear, footgear, Class, Race, and anything else. And with great art from comic artist Shane White, the playmat itself is a valuable piece of treasure, too! As a bonus, there's a special rule for anyone playing with this mat: Once per game, except during combat, discard a Goblin from your hand to take as many Treasures as it is worth! We wish you a Spyke-y Christmas . . . 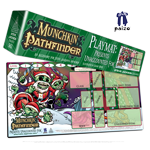 Intimidate your opponents with this Munchkin playmat featuring a scene from every loot-lover's favorite holiday! Illustrated by Lar deSouza, this 14" × 28" playmat includes spots to keep track of your Class, Race, Level, and all the rest of your loot! Bonus: Get an in-game gift for using this mat! You've been good this year – draw an item from the treasure discard pile once per game. 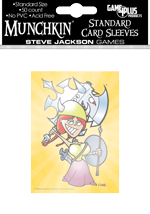 The book also comes with 10 unique Munchkin cards, which means when you're done coloring, you can shuffle the new cards right into any Munchkin game to do some slaying of your own. 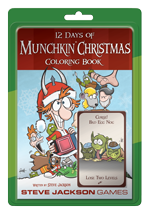 The 12 Days of Munchkin Christmas Coloring Book is illustrated by Len Peralta, the artist behind Munchkin The Guild and Star Munchkin Guest Artist Edition. Protect your standard-sized cards from slobbering dragons, wayward ducks, and most instances of spontaneous combustion with this fabulous accessory for use with any poker-sized deck. Your enemies will shudder in fear when you reveal that your deck is protected by sleeves decorated with the classic John Kovalic image of Spyke and his Chainsaw of Bloody Dismemberment! 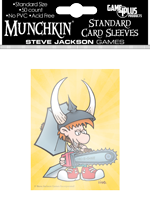 Compatible with many popular collectible card games, you'll also want to use these card sleeves with the upcoming Munchkin Collectible Card Game! Guard your cards . . . even more! Protect your poker-sized cards from natural disasters including tornadoes, flocks of ducks, and bent corners with these high-quality card sleeves. Using them might even help scare off your enemies . . . each sleeve is adorned with John Kovalic art depicting Flower brandishing her Unnatural Axe! 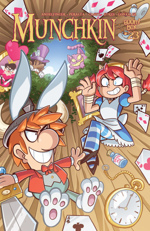 The munchkins jump down the rabbit hole in this month's issue of Munchkin! No, really: They jump. There's no falling involved. And once they hit Wonderland, they . . . hit Wonderland. Hard. A lot. And with assorted weaponry. (Did you expect them to just chat with the Mad Hatter, Alice-style? Nah.) In the second story, find out more than you ever realized there was to know about the psychology of a munchkin fated to fight . . . the Gazebo. There are 12 stages of Gazebo grief, you see. A stockpile of new, ready-to-play Ogre adventures! Ogre Scenario Book 2 has 14 complete, fan-created scenarios, all using components from Ogre Designer's Edition. 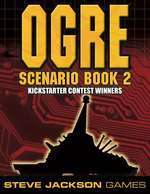 In "Marc-O Polo," a missile strike has damaged the Ogre's sensors, leaving it partially blind. In "Storming the Castle," warlord-led factions compete to capture an embattled AI. And finally, "Wounded Company: Ogre Rescue" follows an impetuous Vulcan determined to rescue an immobilized Mark V. Plus 11 more adventures! Also look for Ogre Sixth Edition, coming out later this month! This is your in-depth guide to giving your GURPS dungeon delver some finesse and flair! 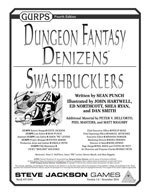 With tons of detail on the swashbuckling professions, GURPS Dungeon Fantasy Denizens: Swashbucklers helps your daring, dashing rogue speak with a sharp tongue, nimbly evade enemy blows, and – of course – dress the part. It even provides variety, with suggestions for crafting unusual swashbucklers. Want to play a portly, middle-aged aristocrat with a quick wit and a sharp blade? You've got it. As a bonus, there are details for plenty of gear, 20 perks, 20 swashbuckling feats, a smattering of new skill specialties, handy Allies, and a few other surprises.